Cordoba has a large monumental and cultural offer for all those willing to discover it and is one of the most visited Spanish cities. 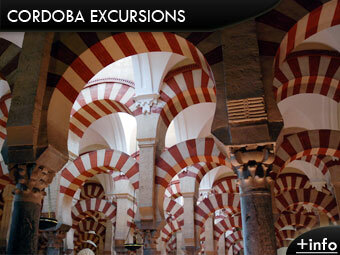 Cordoba inherited monuments and culture of Roman and Muslim civilization, being the Mosque the place to visit. In Cordoba we will enjoy not only the Mosque, but also the Jewish quarter characterized by its many white houses and streets where we find one of the few Jewish temples of medieval Spain. Getting to Cordoba from Malaga is easy if you drive your own car; you can get there in less than 2 hours. The price of the excursion to Cordoba is 45 € and its duration is 1 day, with weekly departures from Malaga every Thursday throughout the year, except bank holidays. The entrance to the Mosque of Cordoba and the Synagogue located in the Jewish quarter are included in the price. Stops are made along the way for breakfast and optionally for lunch in the city centre of Cordoba. Travel insurance, air conditioning (or heating in winter) in a luxury bus and a guide who speaks several languages. Comparing prices of the cheapest train tickets from Malaga to Cordoba, only the round trip is already 45 Euros. Thus, this offer seems pretty good, because we save the price of the tickets to the monuments we visit. Cordoba is one of the warmest provinces in Andalucia during the summer months and one of the coldest during the winter. Bring clothes according to that information. Malaga to Cordoba: Find information on how to get to Cordoba from Malaga and the different options. Car rental in Malaga: Book your own vehicle for visiting Cordoba or any other place during your holidays. Malaga airport transfer to Cordoba: Depending on group size price per person can be very cheap.